"A riotous new twist in the art of gentle persuasion!" Jerry Webster and Carol Templeton are rivals at New York City advertising agencies. Carol hates Jerry's unethical conduct, wining and dining clients to win their business rather than developing the most clever ad campaigns. Carol reports Jerry to the Advertising Council for allegedly promoting a product that doesn't exist, but Jerry pays a chemist to quickly produce a mint-flavored candy with the strength of three cocktails. When Carol is given a sample, she has a one-night stand with Jerry and marries him. Carol applies for an annulment, but Jerry comes back into her life for a very unexpected reason. 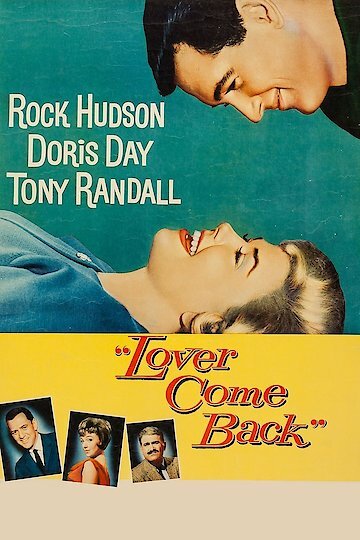 Lover Come Back is currently available to watch and stream, buy on demand at Amazon, Vudu, Google Play, iTunes, YouTube VOD online.